This is a great subject for a guide and the info you've collected looks solid. However, this subject has such great potential as a visually rich guide that I feel you're really missing a lot by having a pure text guide like this. Take a look at some of the highly rated guides (especially the "official" ones made by Perculia) for ideas on how to make this guide look great and resubmit for approval once you're happy. Great guide, I'll use it soon! I wanted to add that using the toy Idole d'ogre sculptée also works. You can still use this toy and have Pepe on your head. News to your Pepe nad Wowhead cathegory! Pepe is the answer to clue #2 for Wowhead's Legion Scavanger Hunt in 2016. Great guide! I want to add another amusing toy interaction. Pepe works with the Réducteur de corps complets, with one catch: Pepe himself does not shrink! He does remain perched on your head, now matching your shrunken height. It's delightful! I wonder if Jeremy Feasel was a fan of the WCW Monday Night Nitro. Commentator Steve McMichael, has a little dog named Pepe. Every episode he dresses Pepe up it a different costume/outfit. Wonder if that is his inspiration for WoWs Pepe? Thorough, adorable and amazingly written guide. Pepe is easily the best part of WoW. 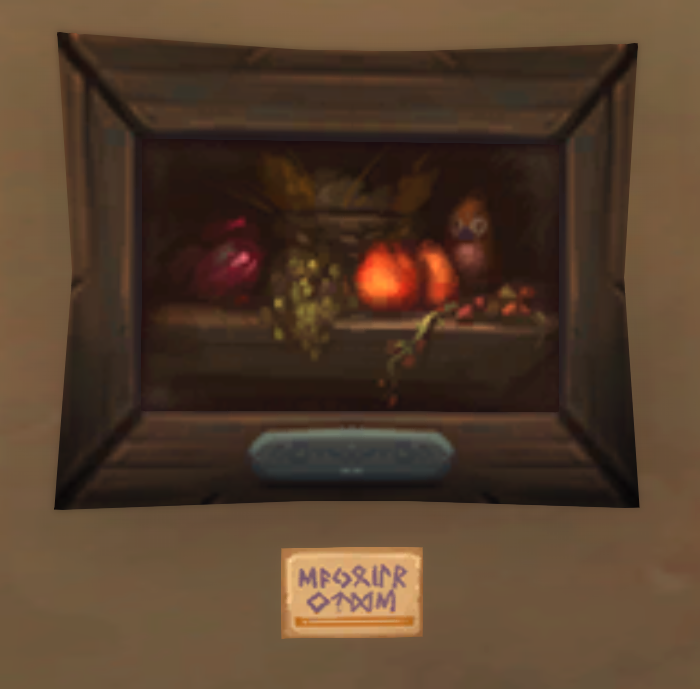 Pepe appears in one of the paintings in Photonic Playground in Dalaran (Legion). He is very small and hard to spot. He also cannot be interacted with. A Tiny Set of Warglaives costs only 1000 Ressources (since whenever...;)) even though the Tooltip says otherwise. Pepe has made his appearance in Zandalar! Saw him tonight with his tiny little troll mask lurking over an inn. Sadly, he wasn't interactable, so no clicking to have him ride on my head for a while! But maybe after I've gotten a bit more rep? A girl can hope. fun fact about pepe in BFA....as a horde player going into the heart of the alliance capital here wasn't gonna be possible for a while....BUUUT creating an alliance class trial for 110 let me get there to pick it up for my account! Is there a way to choose which costume Pepe has on when you summon instead of it being random? Capn' Crackers and Pirate Pepe would look great with my pirate theme transmog. He is also in the Garrison Graveyard when it's Hallows end for the Un ami effrayant Achievement. Pepe is also hanging out in Kings' Rest! Open the alcoves on the walls right after the first boss, before you fight the four sets of ghosts of ancient troll rulers-- and voila! Ekam Bokum Pepe! "If you subscribe to Wowhead's Twitch channel you can gain access to the Pepe Emote." Just thought you would like to know! thanks for the great page. Can anyone confirm if "A Tiny Set of Warglaives" is a costume for Pepe that gets included in the shuffle, or is it a separate toy in your collection? Thank you! Ghost Pepe is a lie !